Cecile Lablache was born in the Seychelle Islands, blind at birth as were another two of her family of seven, she found schooling a challenge and did not have the opportunity to achieve encouraging results. Cecile later joined a singing group of blind youth who made their mark at hotels and other venues on the Islands which gave the youngster much needed confidence. As a young woman she traveled to the UK and Wales, India and Canada before coming to Australia in 1997. Cecile’s life and work when she arrived here was taking care of ‘George’ an elderly gentleman who died at 94. Cecile then found ways to make herself useful to others until she was given the chance to pursue a massage career at Croydon Tafe around 6 years ago. She moved from Chirnside Park in Melbourne to Cowes 3 1/2 yrs ago and now runs a successful business, Cowes Therapeutic Massage Centre, with her partner Lance. Cecile's tale truly demonstrates that talent has no boundaries. SBWN member and National Disability Coordination Officer Andrea Evans-McCall is MC for our luncheon. The NDCO Program works strategically to assist people with disability access, and participate in Tertiary Education and subsequent employment, through a national network of regionally based NDCOs. The NDCOs work with stakeholders at the local level to reduce systemic barriers, facilitate smooth transitions, build links and coordinate services between the education, training and employment sectors. 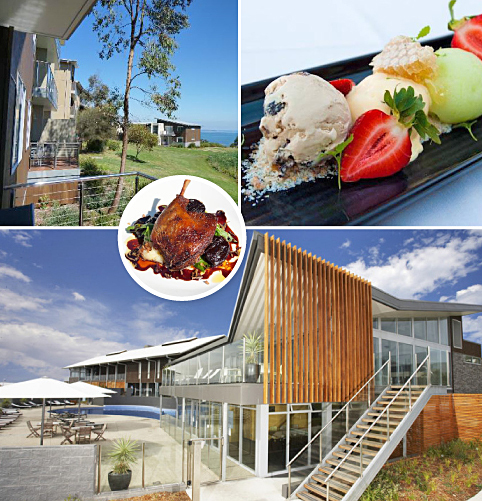 Our venue for June is Silverwater Resort The resort was very recently awarded a TripAdvisor 'Award of Excellence' and are finalists in the restaurant and resort categories of the Tourism Accommodation Australia 2014 State Awards for Excellence. This venue promises our June luncheon will be held in quite salubrious surroundings. Silverwater Resort are offering all SBWN Ladies 20% discount on their stay on the best available nightly room only rate. The special would only be applicable if booked online on the Silverwater Resort website and only valid for stays from Friday 13 June – Monday 16 June 2014. Special Note: We have a shorter lead time on this event and it will close for registrations on Monday the 9th of June. Join us this June for Cecile's inspirational and instructional life and work experience and soak up the fabulous atmosphere in true resort style. Top left: Balconied apartments overlooking sea views. Top right & circled: Silverwater are finalists in the restaurant category of the Victorian Accommodation Awards for Excellence. Bottom: A fabulous venue for our June luncheon.